Posted to the Latest Sightings YouTube channel, this dramatic footage was captured by 22-year-old student Robyn Wessels on a self-drive safari in South Africa's Kruger National Park earlier this month. When Wessels and her husband arrived at Transport Dam near the park's Skukuza rest camp in the early hours of the morning, all was quiet. The couple was on the verge of leaving when an impala suddenly burst onto the scene with a pack of wild dogs in hot pursuit. 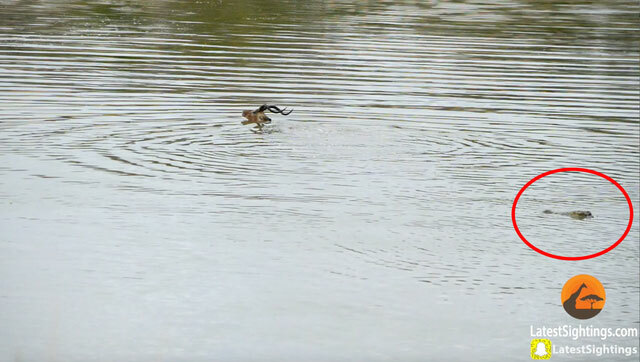 "I quickly grabbed my camera and began to shoot the video," Wessels told Latest Sightings. "We were so shocked, I was shaking while busy taking the video. We could not believe our eyes!" 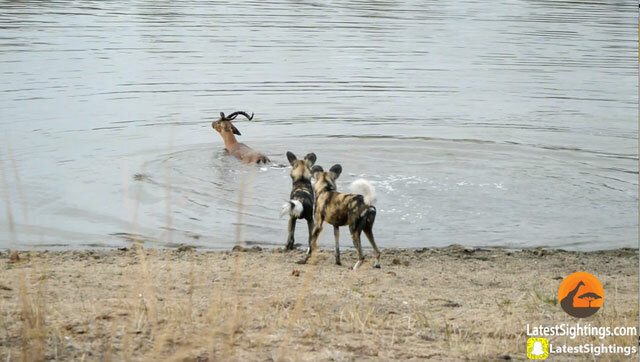 In an effort to flee its canine pursuers, the impala plunged into the water, but its escape plan soon backfired. After a territorial attack from a hippo, the exhausted antelope was eventually dragged into the depths by a crocodile. Only around 6,600 wild dogs roam the African continent, so catching the canines on the hunt is a rare sight. Tight social bonds and a complex vocal repertoire help these carnivores reach a level of hunting cooperation that much larger predators can't match, and a well-coordinated pack can bring down prey with a startling success rate. Tactics and strategy play a big role in the dogs' hunts, and this is not the first time we've seen a pack use a body of water to its advantage. Last year, photographer Hannes Lochner witnessed four separate animals being driven into Botswana's Khwai River by wild dogs, giving us some insight into the predatory abilities of these mottled canines. While big cats like lions and leopards rely on ambush tactics to secure a meal, wild dogs are built for endurance hunting. Keen senses and a lean, muscular build combine with powerful jaws and teeth specialised for shearing and crushing bone to make up one of Africa's most successful hunters. In this instance, however, the dogs lost out to another predator that was likely attracted to the action by splashing and movement in the water. Although the majority of the Nile crocodile's diet is made up of fish, these opportunistic predators rarely overlook an easy meal – and an exhausted impala is certainly easy pickings. 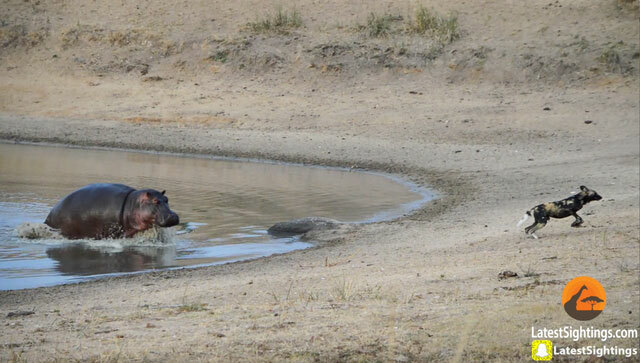 As for the hippos joining in on the action, we'll notch that one up to turf defence. 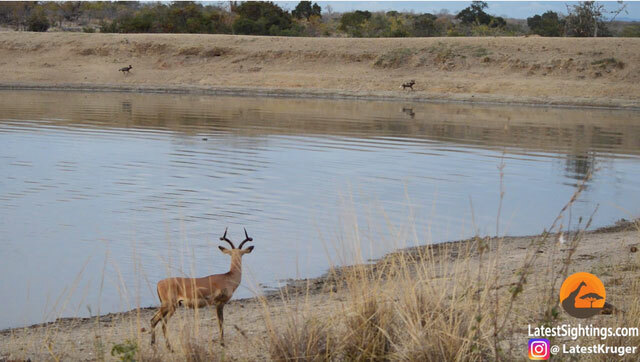 Although they have been recorded feasting on meat, these languid animals typically fill their bellies with grass, so the impala wasn't on their menu. It's more plausible that the hippos were merely defending their turf. Dominant bulls in particular can become aggressively territorial. The impala's choice of drinking spot may also have sealed its fate. Kruger's Transport Dam is not a hangout we'd recommend for animals looking to avoid a run-in with Africa's top predators. 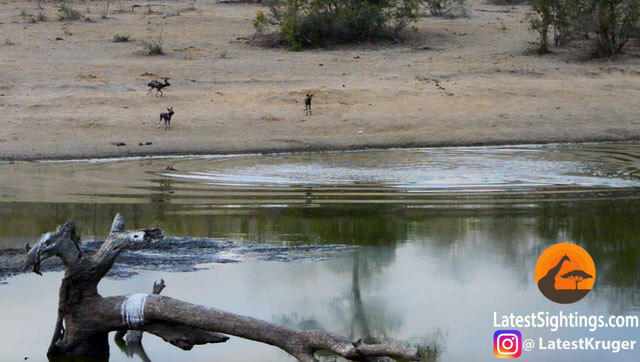 If the location looks familiar to you, that might be because the dam was also the setting for what is arguably the most famous viral video to come out of the Kruger National Park.